The Patria del Friuli’s ancient emblem is the golden heraldic eagle on a sky blue field. Art. 2 of Regional Law no 6 of 27 March 2015states that, “The flag of the Friulian community consists of a rectangularstandard with at its centre a golden heraldic eagle with outspread wings, headturned to the left, open beak and red claws, set in a sky blue field. The crestcovers three fifths of the height of the flag, which in turn is two thirds ofits length”. Art. 3 of the law regulates its display in the following terms: “In accordance with art. 6 of Regional Law no 27/2001, local authorities and the Region’s offices may display the Friulian flag outside their premises on the occasion of the ‘Fieste de Patrie dal Friûl’; the first time it is displayed, the regional administration is authorized to provide free of charge a flag for external display to local authorities that apply for one”. The most famous and earliest specimen of the patriarchal standard hangs outside the Duomo of Udine. It was sewn onto the white linen cloth that was wrapped around the body of the patriarch Bertrand of Saint Geniès, who was patriarch of Aquileia from 1334 to 1350 and was barbarously killed in a conspiracy by Friulian nobles. 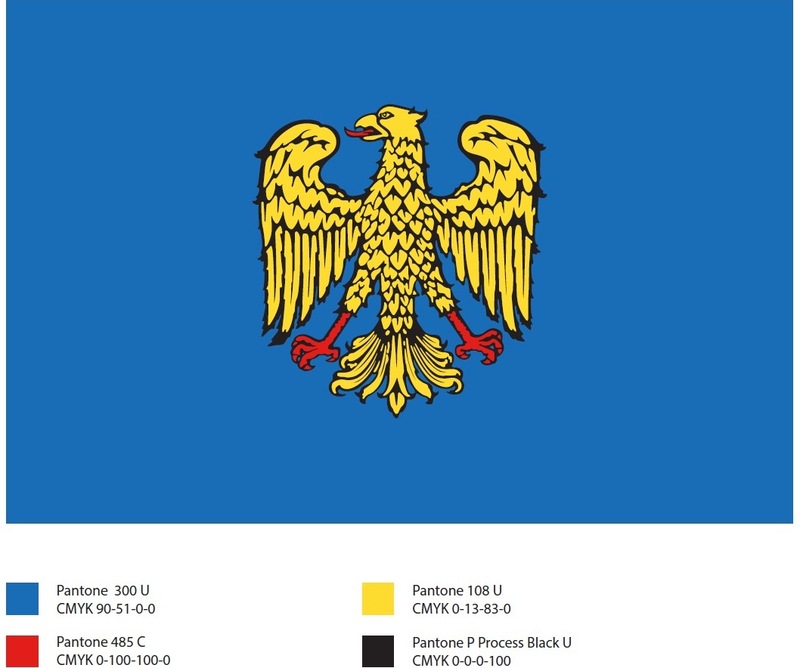 This ancient standard is still Friuli’s universally recognized flag. It should not be confused with the flag used in purely administrative functions denoting the Region of Friuli-Venezia Giulia, which is far more recent (1963) and has a completely different historical significance (in the regional flag, the eagle represents Rome coming to the assistance of Aquileia, symbolized by the tower below). The Friuliancommunity’s flag is made up of a rectangular standard with at its centre a golden heraldic eagle with outspread wings, head turned to the left, open beakand red claws, set in a sky blue field. The crest covers three fifths of the height of the flag, which in turn is two thirds of its length. Size in centimetres: 200×300, 150×225 and 100×150.